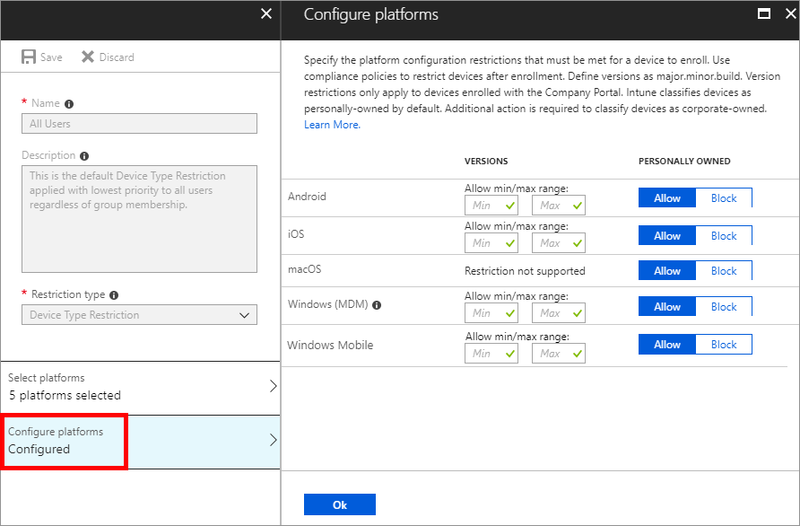 As an Intune administrator, you can create and manage enrollment restrictions that define the number and types of devices that can enroll into management with Intune. You can create multiple restrictions and apply them to different user groups. You can set the priority order for your different restrictions. Enrollment restrictions are not security features. Compromised devices can misrepresent their character. These restrictions are a best-effort barrier for non-malicious users. Maximum number of enrolled devices. Restrict personally owned devices (iOS, Android, Android work profile, macOS, Windows, and Windows Mobile only). Default restrictions are automatically provided for both device type and device limit enrollment restrictions. You can change the options for the defaults. Default restrictions apply to all user and userless enrollments. You can override these defaults by creating new restrictions with higher priorities. Select More Services, search for Intune, and then choose Intune. Select Device enrollment > Enrollment restrictions. Give the restriction a name and description. Choose a Restriction type, and then select Create. For device limit restrictions, select Device limit to set the maximum number of devices that a user can enroll. 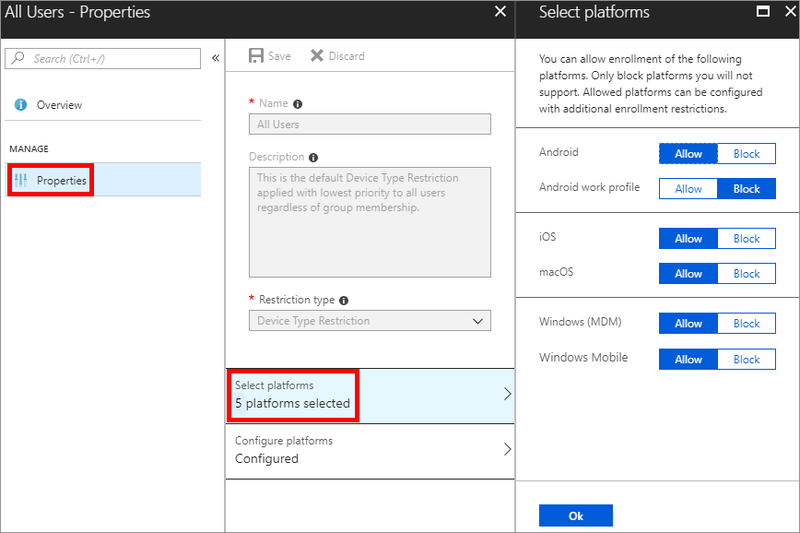 For device type restrictions, select Platforms and Platform configurations to allow or block various platforms and versions. Select Assignments > + Select groups. Under Select groups, select one or more groups, and then choose Select. The restriction applies only to groups to which it's assigned. If you don't assign a restriction to at least one group, it won't have any effect. The new restriction is created with a priority just above the default. You can change the priority. You can change the settings for a device type restriction by following the steps below. These restrictions don't effect on devices that have already been enrolled. Devices enrolled with Intune PC agent can't be blocked with this feature. Under Device Type Restrictions, choose the restriction that you want to set > Properties > Select platforms. Choose Allow or Block for each platform listed. Android work profile support major.minor.rev.build. iOS supports major.minor.rev. Operating system versions don't apply to Apple devices that enroll with the Device Enrollment Program, Apple School Manager, or the Apple Configurator app. Windows supports major.minor.rev.build for Windows 10 only. Windows 10 does not provide the build number during enrollment so for instance if you enter in 10.0.17134.100 and the device is 10.0.17134.174 it will be blocked during enrollment. 8. Choose whether to Allow or Block Personally owned devices for each platform listed. 9. Choose OK. If you block personally owned Android devices from enrollment, personally owned Android work profile devices can still enroll. By default, your Android work profile devices settings are the same as your settings for your Android devices. After you change your Android work profile settings, that's no longer the case. If you block personal Android work profile enrollment, only corporate Android devices can enroll as Android work profile. The device is registered with Windows Autopilot but isn't an MDM enrollment only option from Windows Settings. * These won't be blocked if registered with Autopilot. Under Device Limit Restrictions, choose the restriction that you want to set. Select Device Limit, and then in the drop-down list, select the maximum number of devices a user can enroll. Device limit restrictions are not enforced for these enrollment types because they are considered shared device scenarios. You can set hard limits for these enrollment types in Azure Active Directory. Priority is used when a user exists in multiple groups that are assigned restrictions. Users are subject only to the highest priority restriction assigned to a group that they are in. For example, Joe is in group A assigned to priority 5 restrictions and also in group B assigned to priority 2 restrictions. Joe is subject only to the priority 2 restrictions. When you create a restriction, it's added to the list just above the default. 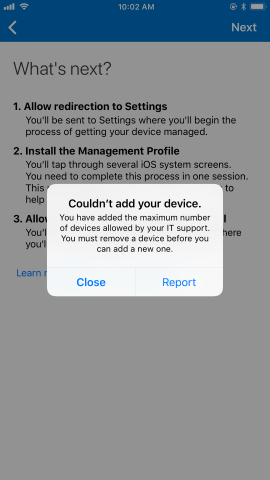 Device enrollment includes default restrictions for both device type and device limit restrictions. These two restrictions apply to all users unless they're overridden by higher-priority restrictions. You can change the priority of any non-default restriction. Hover over the restriction in the priority list. Using the three vertical dots, drag the priority to the desired position in the list.